A lotta folks who know me know that I returned to college when I was 31. I remember thinking "How hard could it be?"... I've always enjoyed reading and learning, and didn't think the decade and a half I spent outside of the academic life would affect the way I received and processed new information. Then... I cracked open my first textbook. I remember staring at it, and watching the words begin to dance with one another... everything was so dense and nothing at all made any sense (hey, that rhymes!). So much of it was also quite dry and dull. It was at that point, I realized just what I'd gotten myself into... and concluded that, "Hey, this is gonna be pretty hard." I say all of that, so I might say this... I had a similar feeling when reading the first half of Genesis. There is so much dense-but-dull information to process and digest in this story... that I feel like I'm trying to parse information for an exam. Like I should be reading this thing with sticky notes and a highlighter. I mean, I literally just finished this issue... and I'll be damned if I can remember a single thing I read. 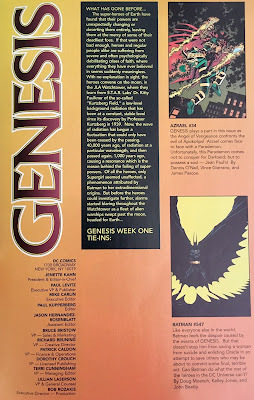 We open with a three-page recap of what happened last issue. Superpowers are on the fritz, Kitty Faulkner gives us the down-low on the Kurtzberg Field, and an alien armada descends on Earth. Up to speed? Good. 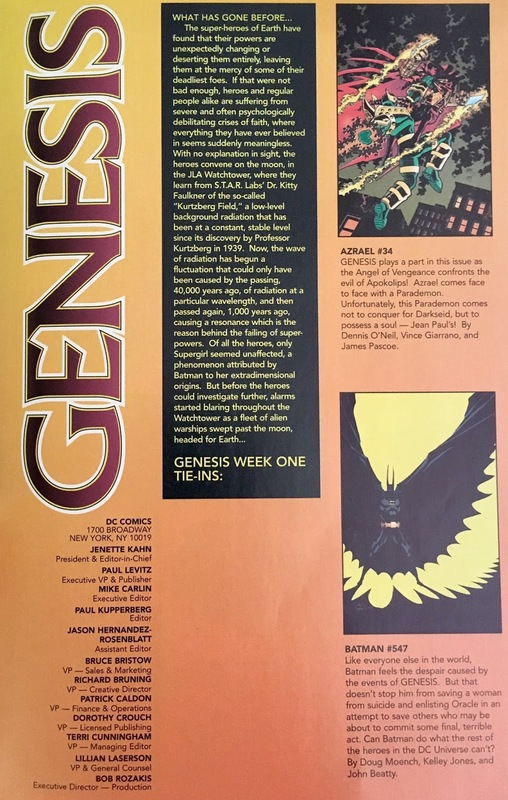 From here we jump back to New Genesis, where Takion is (still) talking about not being able to locate Darkseid. 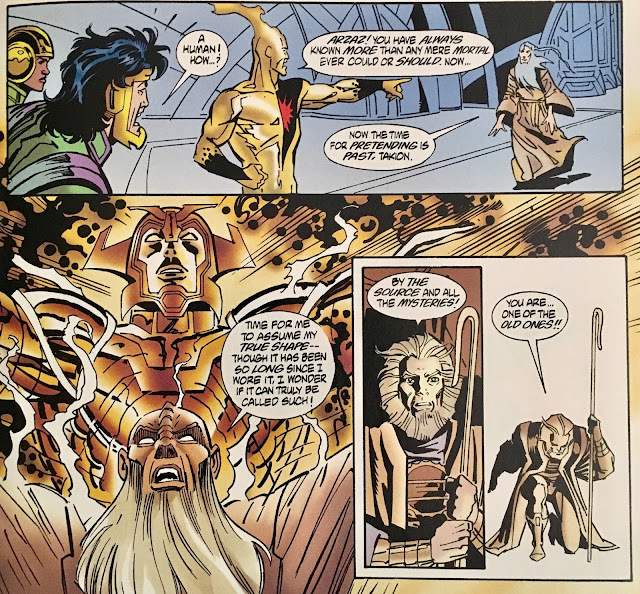 The New Gods are approached by a mortal called Arzaz, who it appears was a part of the Takion limited series, not that we'd get an editorial note to tell us such. Takion goes to send him away, and he reveals his true form. Arzaz is, in reality, an Old God from the First World. Ay yai yai. He warns that the looming doom threatens to wipe the Fourth World out of existence, and will usher in a terrible Fifth World in it's place. Got all that? Back on Earth, several stereotypical folks watch as the sky fills with alien crafts. It's not terribly clear, but it seems as though some of these ordinary humans might be starting to display sparky electrical powers. We shift to Gateway City, and check in with our new friend Officer Mike Schorr. He is trying to maintain the peace as the citizens panic. Gotta say... the officers are wearing "GCPD" armbands, which doesn't quite make me think "Gateway City Police Department". Anyhoo, Artemis stomps onto the scene... didn't realize she had short hair. Oh, she doesn't. They just forgot it in that panel. She tries to keep the peace via threatening force with her American Gladiators looking swizzle-stick. She takes down a couple of goofs... and is shortly joined by Queen Hippolyta and Donna Troy. Together they hold off the angry (angrier?) mob. The next scene is a bit strange. We head to Landis Fields, West Virginia where we join a foursome walking down a street toward a church. It seems that this town is seeing a spike in suicide, with 22 cases in the past few days. 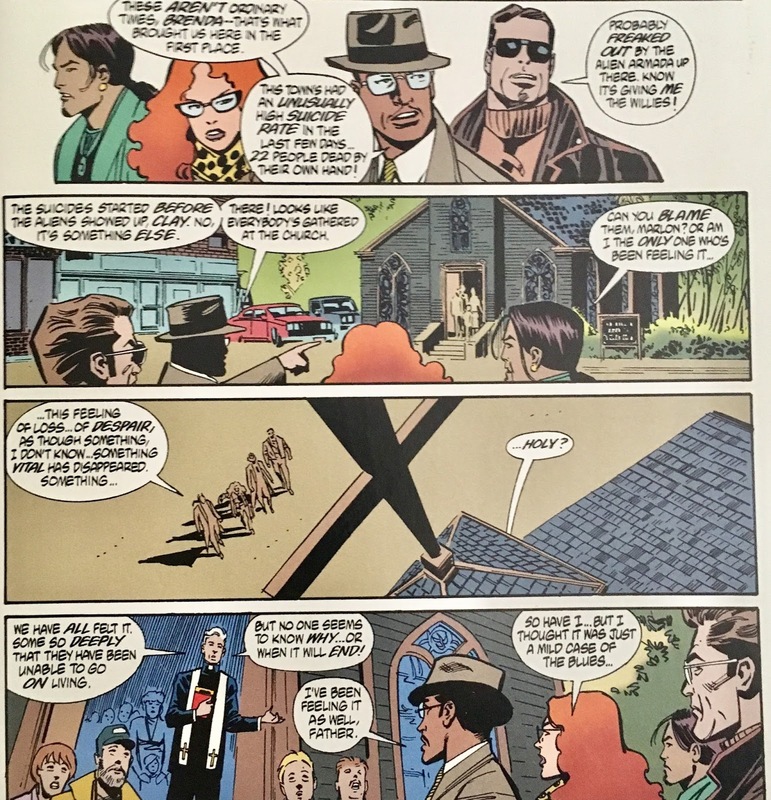 They chat with the priest , who is also rather confused by the events. Looks like another case of lost faith. 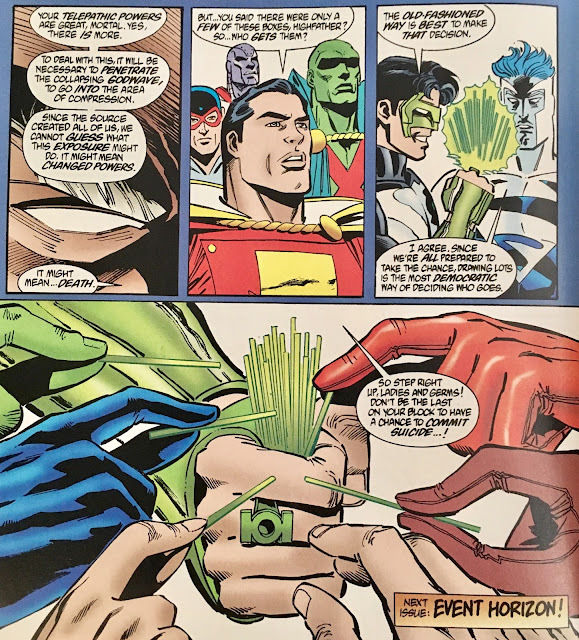 In Hawaii, we join Superboy as he himself is joined by... the Ravers! Remember them? They are happy to see that he is still among the living, and together they decide to teleport "straight to the source" of the looming doom. When they do, they find themselves standing before... God? 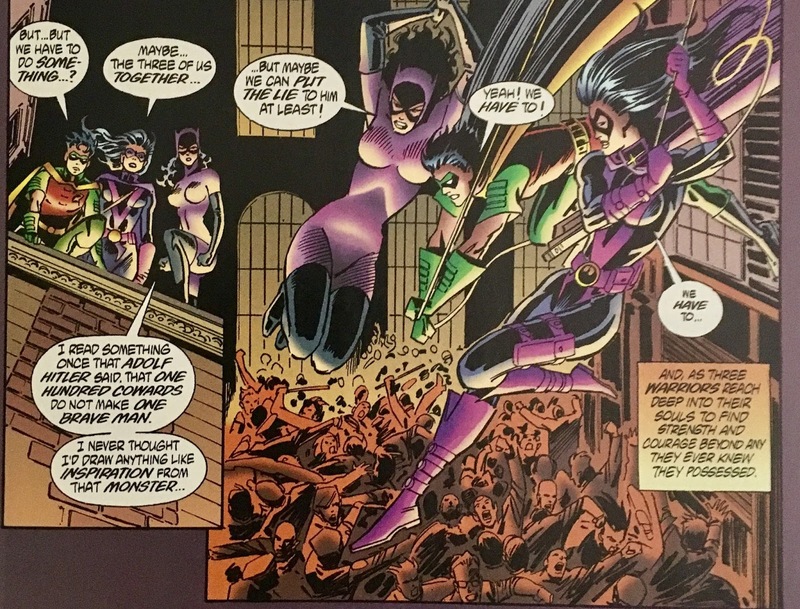 At the same time in Gotham City, Robin and the Huntress watch a riot from atop a nearby building. They are both too scared to intervene. Shortly they are joined by Catwoman who... get this, quotes Hitler... to motivate them into joining the fray. 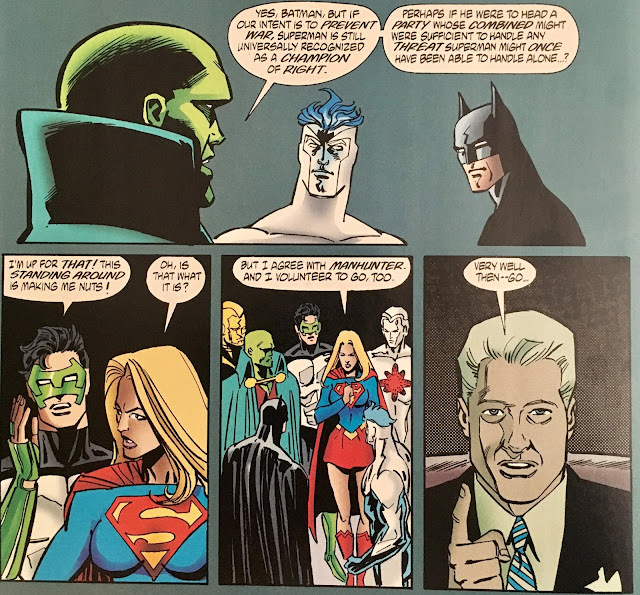 We shift scenes to the White House, where the heroes are addressing (and being addressed by) President Bill Clinton. Gotta say, it is refreshing to see a U.S. President not being treated like a clueless putz in a comic book. Here, Superman is given the lead. He will greet the invaders under a white flag in attempt to reason with them, while flanked by the rest of the heroes. Clinton is wary, but ultimately agrees. 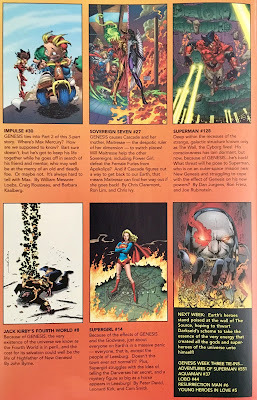 We can see on the news that the invaders have landed... among them are some familiar faces in the forms of Granny Goodness and Kalibak. Looks like Darkseid might be behind this after all. No duh. 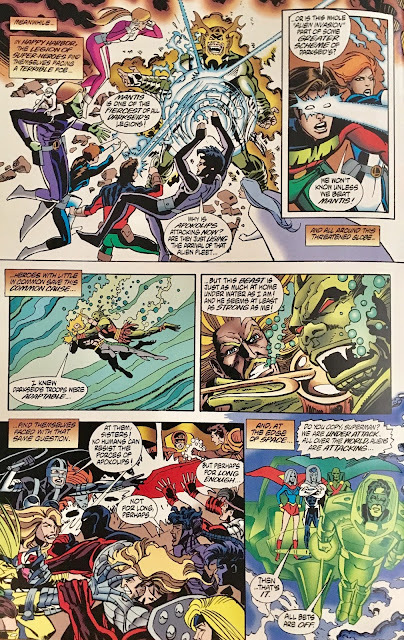 As further evidence of Darkseid's involvement, the Teen Titans T-Jet is attacked by a crew of Parademons. 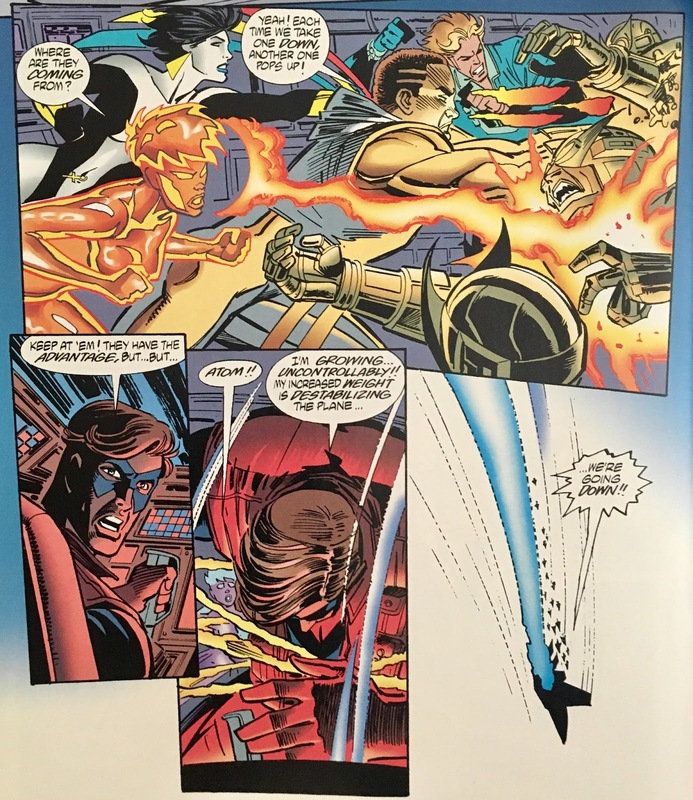 The team does a decent job holding them off... until the Atom (this is Teenage Atom era Teen Titans) loses control of his size-shifting abilities. He grows uncontrollably, sending the jet into a tailspin. 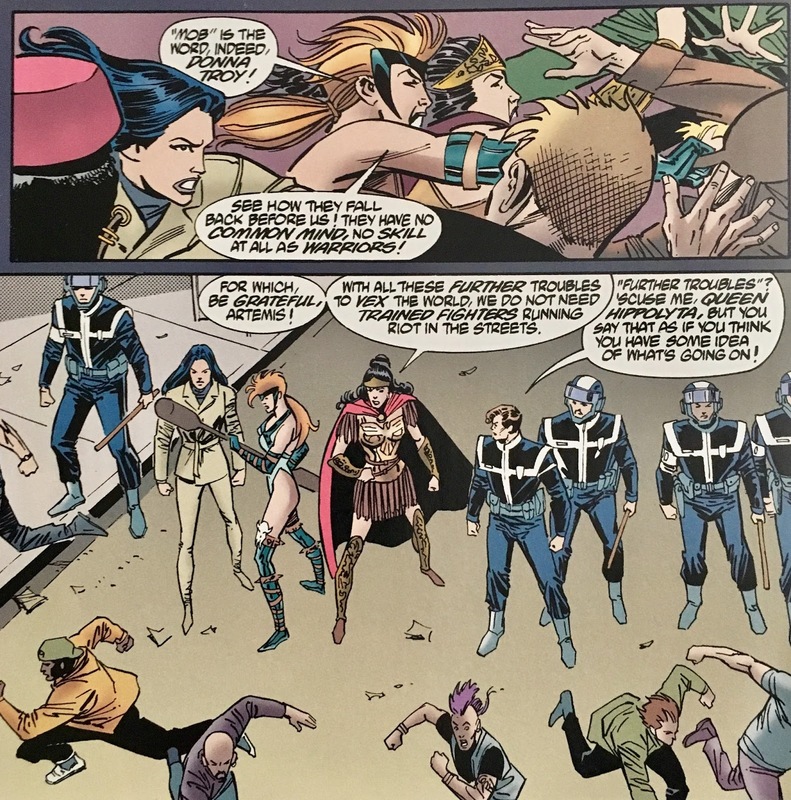 All around the world, the heroes are faced with Apokoliptian threats. The Legionnaires fight off Mantis, Aquaman engages in undersea battle with a frogman, the Sovereign Seven (!!!) fend off the Female Furies. Wonder how Byrne felt about adding them to his story? Elsewhere, the Martian Manhunter meets with the Darkstars and Omega Men in attempt to procure their support. He is called a traitor, and told to beat it. Before he can... the Highfather appears! All of the heroes are present as well... and we're about to enter some brain-hurty pages. 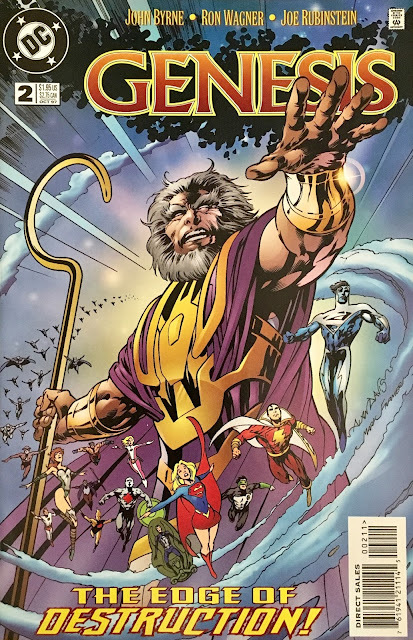 The gist of the Highfather's spiel is that "ages ago" a Great World exploded... releasing a "God Wave" which spread universe-wide, and is responsible for the creation of all the Gods who we ordinary folks may believe in and worship. When the wave expanded to fill the entirety of the universe, it doubled-back on itself... this second wave is responsible for superpowers... and access to them (the Speed Force, Quantum Field). At this point, the God Wave is contracting... which somehow means that the universe will be wiped out and replaced with the "new and terrible" Fifth World. In this most opportune time, Darkseid plans to seize the power of the God Wave to attain Infinite Power. Still with me? He continues, informing the heroes that there is still a chance to fix things... however, should they attempt, it may result in altering their powers, or ya know... death. In order to choose who will face Darkseid head-on, Green Lantern wills up a wad of sticks so the heroes can "draw straws". Woof. Still a snooze. 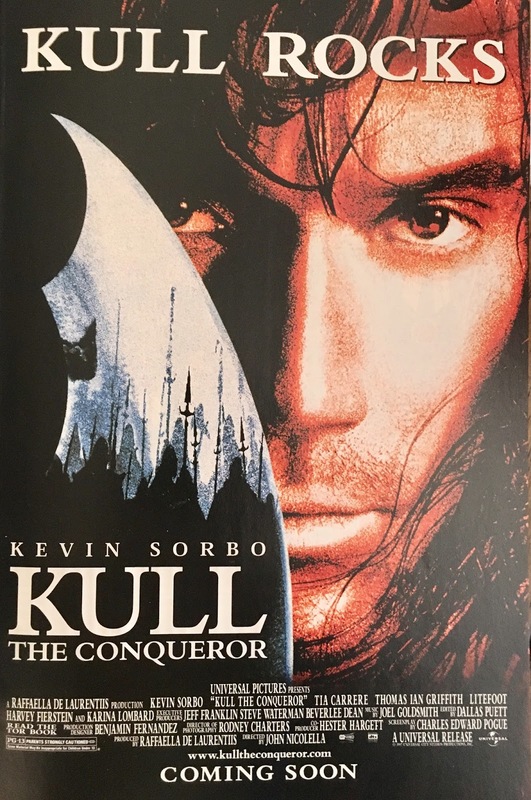 I really wish I could summon the interest to either like or hate this story... but at the end of the day, it's just a boring story... with a sorta-kinda clever premise. That premise concerns a "Godwave" being the source of pretty much everything we know to be true. Superpowers and access to them are the result of the wave. 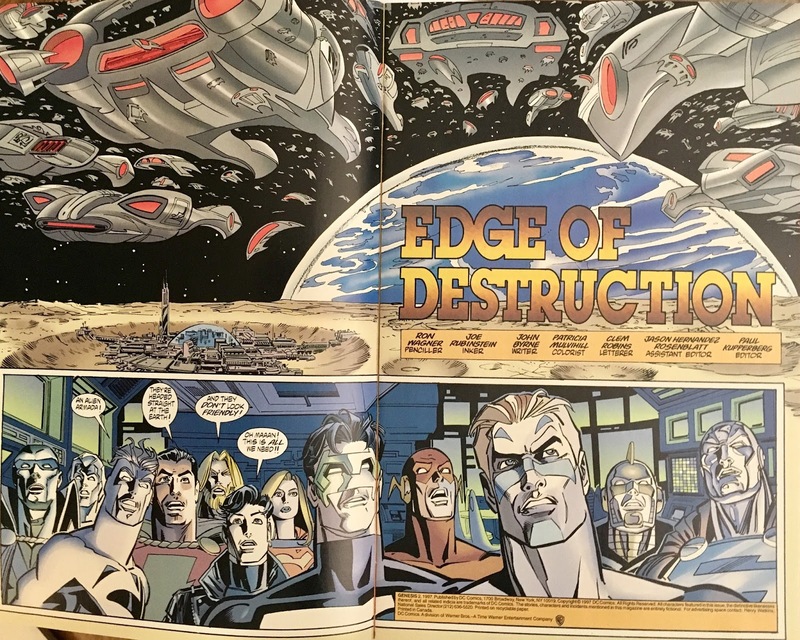 It's a decent sci-fi idea, but not one I dig for the DCU. It's a bit reminiscent of the White Event of Marvel's New Universe... which, I wouldn't figure to be something Byrne would invite comparison to. Then again, I might be projecting. With all that said... I can't help but to feel that Byrne is being earnest in this endeavor, which makes it hard to really bag on it. This seems like he truly feels he needs to explain why superpowers exist. 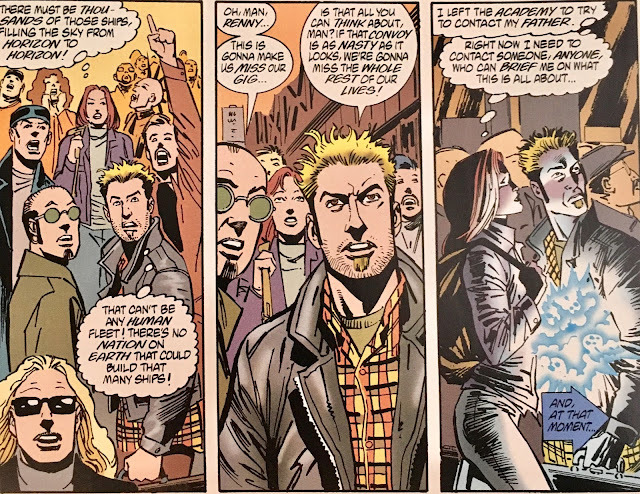 I mean, I don't think that's a question worth answering (or even asking)... but that's kinda Byrne's thing. I remember reading a bunch about how he would explain things down to the tiniest granule of minutia when revitalizing Superman for the post-Crisis world. There's something almost charming there... almost. Then you remember we're reading comics, and there are a few things we just want to "accept". Over-explanation can sometimes be worse than no explanation at all. 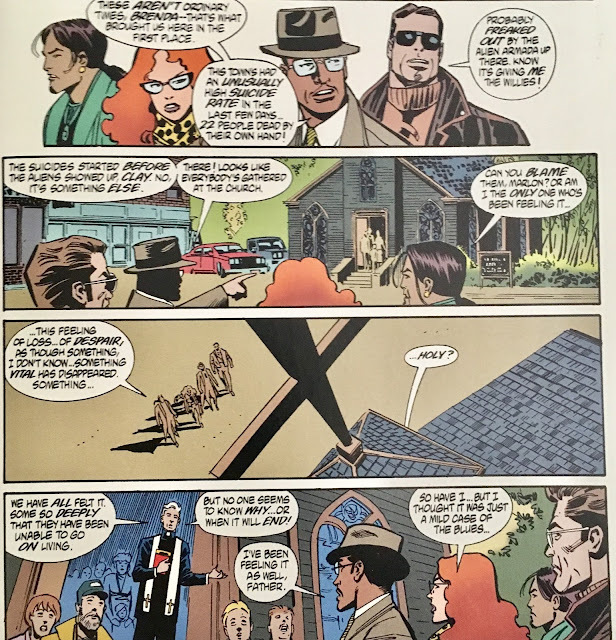 Like much of Byrne's output post-1990, I feel as though it's biggest weakness is in the framing. When we discussed Lab Rats all those months ago, I discussed ways in which I thought it could work... here, with Genesis... I do think there might be a story worth telling here... though, it might be better for an Elseworlds story. I don't want to think that everything we know about the DC Universe is the result of a "Godwave" bouncing back on itself. Even for comics, it's a bit far-fetched. Though, to be fair... in a vacuum, it's a clever idea. 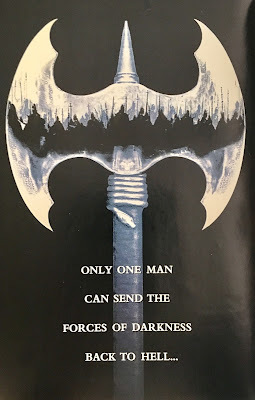 In my opinion, not worth exploring in the canonical DCU... but for an Elseworlds, why not? The only thing that kinda stands out to me is the ordinary folks being somehow affected. Their loss of faith might have something to do with the God Wave that created the objects of their faith being depowered/erased, I suppose. I'm unsure what's going on with the electrical powers manifesting in those people on the street. Wonder if they will become the New-er Guardians... er, Gods. 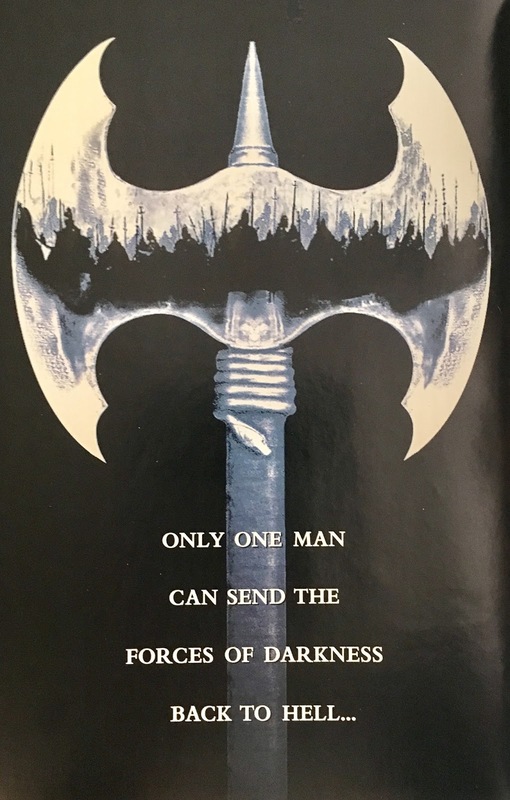 As if I needed another reason to compare this to Millennium. The art here is just as uninspired as the previous chapter, really not digging it. There's almost a rushed feeling to it, though that might just be my untrained artist's eye talking. Lotta backgrounds missing here... though, given some of the locales used, it might be excusable. Really not much more to say. It's still dull... and I still can't recommend it. I'm fine with this "project" being an "I'll read it, so you don't have to" sort of affair. Hm, I in no way want to the knock Wagner/Rubenstein art team, but I have wondered if they had just temporarily taken over the art chores on either Wonder Woman or JK4W at the time of this event - and Byrne penciled this mini, whether it would be any easier to digest? I know I'm in the minority here, but I'm not a fan of the Legends mini series. The event, the concept, the tie-ins were mostly fine, but the mini, itself is a chore for me to read - so much endless recap nothing seems to happen for pages & pages - but those pages are so well illustrated. 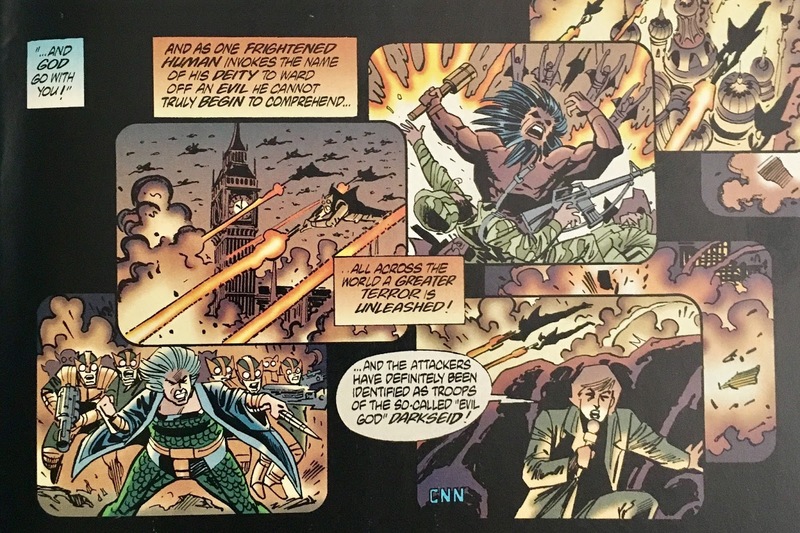 Byrne art (+ compatible inker) can make dull stories readable - and I wonder if this could have 'saved' Genesis? 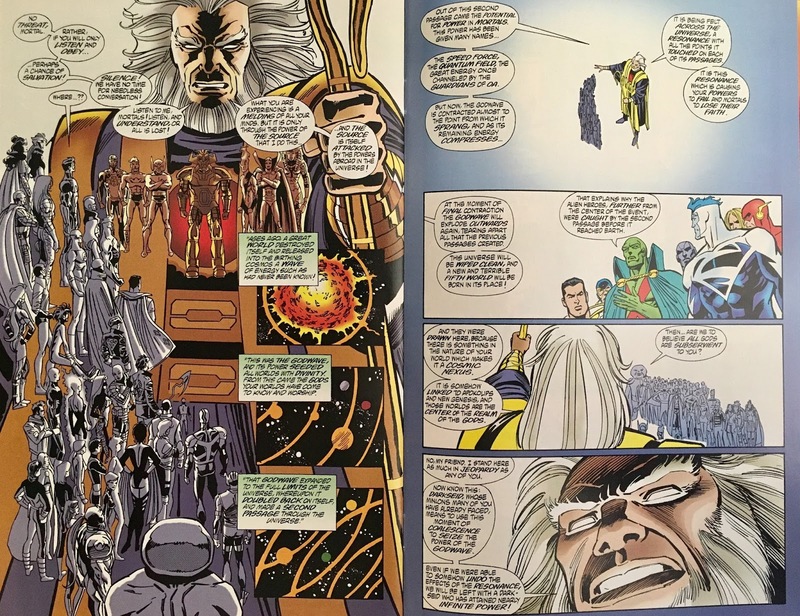 I do think Byrne art could have helped the way Genesis was received... heck, if they could've gotten Alan Davis to do interiors we might all remember this event differently! I am actually on the same page as you as it pertains to Legends. It's been awhile since I've sat down with it, but I remember the last time I tried, I only made it about halfway. Far too much in the way of exposition and "catch-up"... it's difficult to truly enjoy if you don't have a stack of the tie-ins along for the ride.